Lost in the glory and glamour of the Mercedes-Benz 300SL Gullwing, it is easy for the smaller and less powerful 190SL to be overshadowed and forgotten. This should not be. 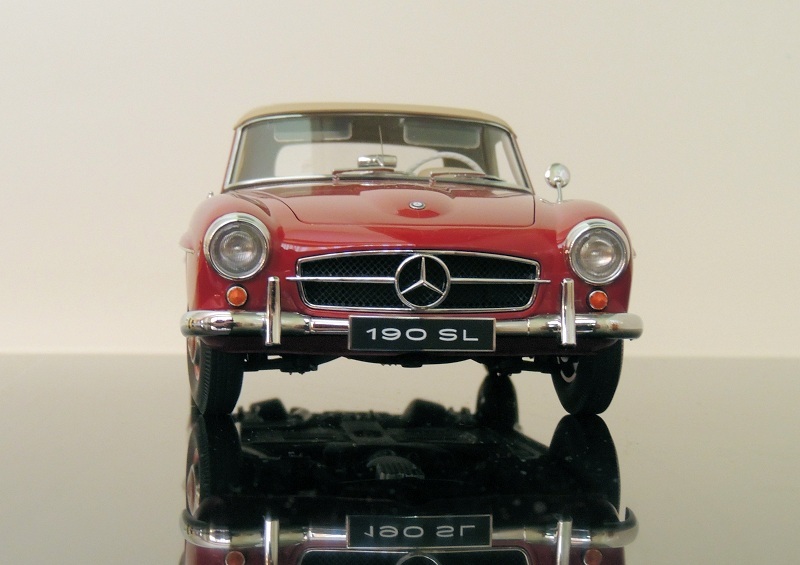 Despite its dynamic inferiority to its famous stablemate, the 190SL was still a beautiful, high-quality sports car which maintains its timeless elegance today. Maybe this is why Maisto, Norev, and AUTOart all make one in 1:18 scale. The former is rather poor, the middle rather good, and the latter is excellent. 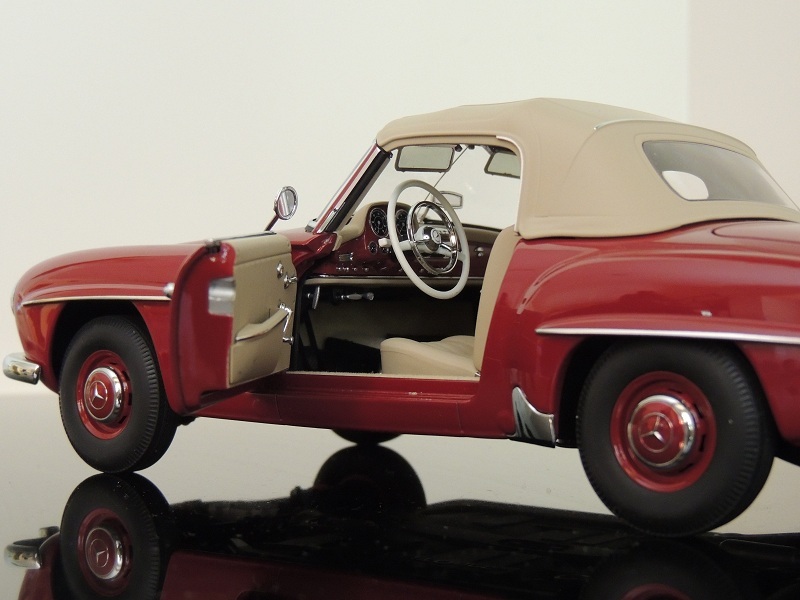 Forming part of AUTOart’s Millennium range, three different 1955 Mercedes-Benz 190SLs are offered: a cream one with a black interior, a black one with a red interior, and a red one with a beige interior. The latter two, in my opinion, look the best – although keeping the black variant from perpetual dust would prove difficult. 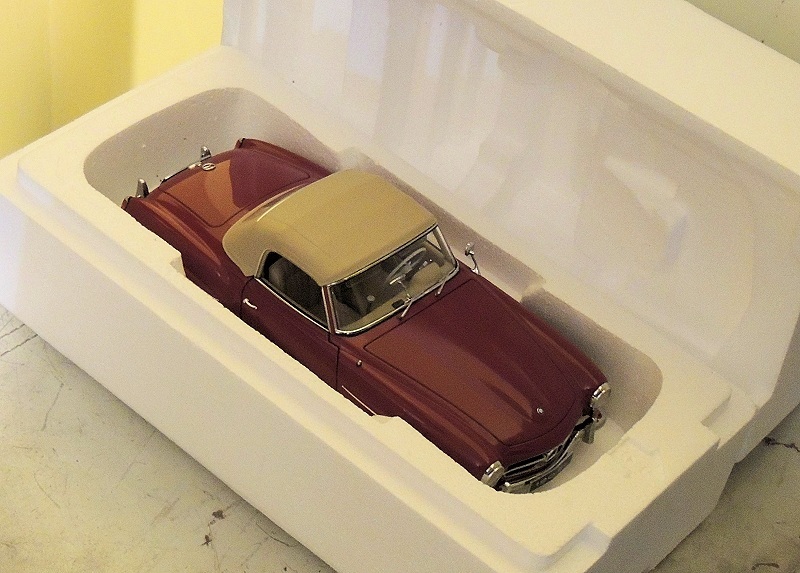 Opting for the red exterior/beige interior, taking the model out of the Millennium box was a pleasing experience. The top half of the Styrofoam crate contains a removable roof piece in closed pose, and a removable roof piece in open pose. The choice of display – is up to you! The model is bolted into the bottom crate with four screws. The problem with reviewing AUTOarts is that there is virtually nothing to fault about them. 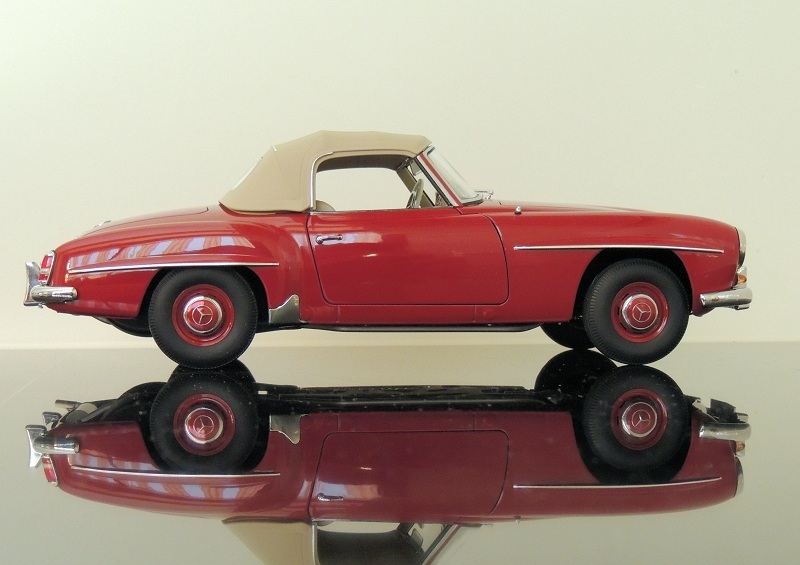 Kyosho models are beautiful, but there are always little niggles, Sun Stars are usually good, but quality control is sometimes dubious– but AUTOarts are consistently excellent. You might not get opening glove boxes or sliding sunroofs, but what you do get, is always good. Such is the case with this model. The chrome is not excessive or glitzy, the grilles are beautifully chiselled, the decals realistic, and all exterior craftsmanship is universally brilliant. No mould lines, no studs in the lights, no paint blemishes, nothing. 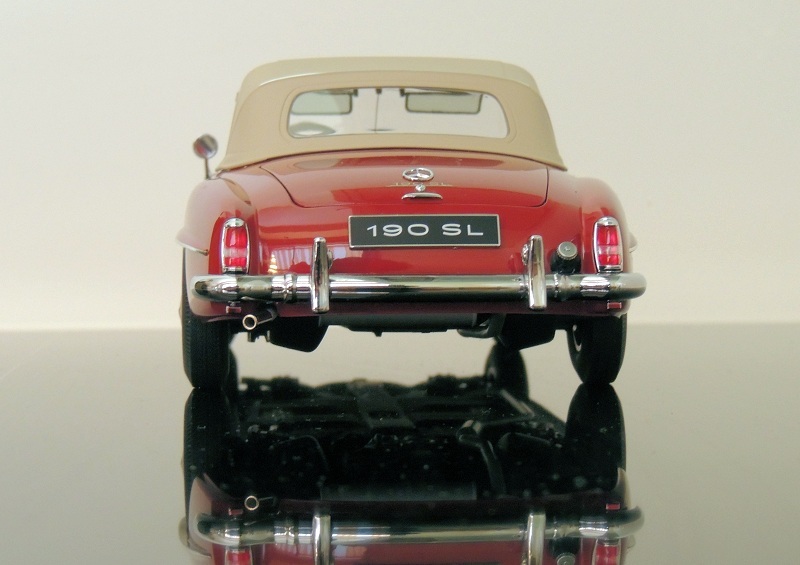 The removable roof pieces are finely sculptured to resemble canvas, the indicators are encircled by miniscule chrome rings, and altogether – as should be the ultimate aim of all model cars – it looks like the 1:1 shrunk down. The interior is similarly excellent. All instrumentation is well-rendered, the plush carpeting looks stunning, and the rubber mats are not just bare plastic imitations, and actually feel as realistic as they look. The small silver touches are fine and accurate, while the seats have a lovely satin finish. A particularly nice soupçon of class is the functioning sun visors, which are lightly tinted with the accurate blue hue. Having seen these same Mercedes-Benz visors represented – on Maisto’s 1954 300S – by a cheap blazing-blue sticker, it is amazing to see the improvement that an extra $100 bestows! Opening the shapely bonnet, one will find that the engine, unsurprisingly, is a reflection of the rest of the model. Nicely painted, nicely finished, nicely detailed motor, leads, caps, and other mechanicals are in order. There is a little metal strut (to hold the bonnet open) which must have been replicated from the 1:1 for mere appearance in the 1:18, for it is fragile and doesn’t seem to be functional. The boot is not as characteristically boring as most are, for there is a partly hidden spare wheel – lacking the hubcap, of course – surrounded at the base by the boot’s plastic mat. And that’s where the only discernible fault with this car lies. Considering that AUTOart did the rubber mats in the foot-wells with actual, flexible rubber, why is the boot not done similarly? Moving on, we find another silver strut, slightly more functional than its counterpart under the bonnet. Though perhaps it’s not meant to be. 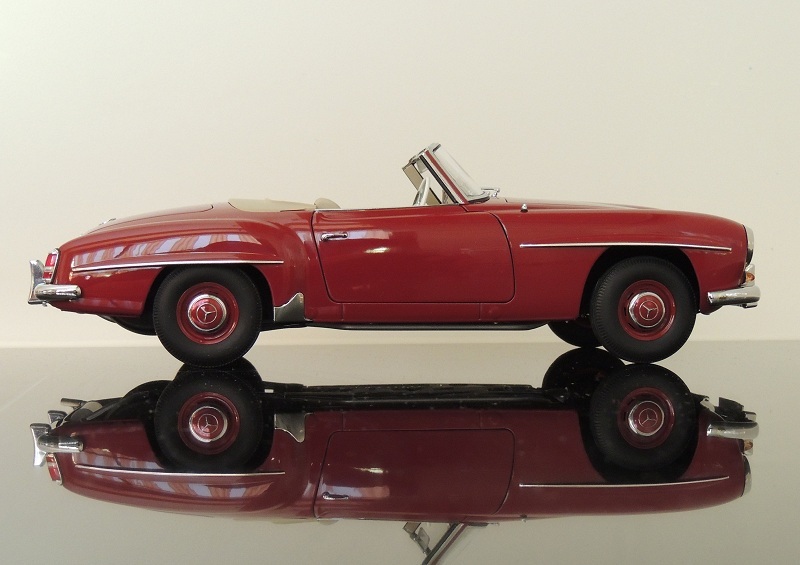 So here we have it – a quaint replica of an elegant and competent ‘50s sports car, finished to traditional AUTOart quality standards. 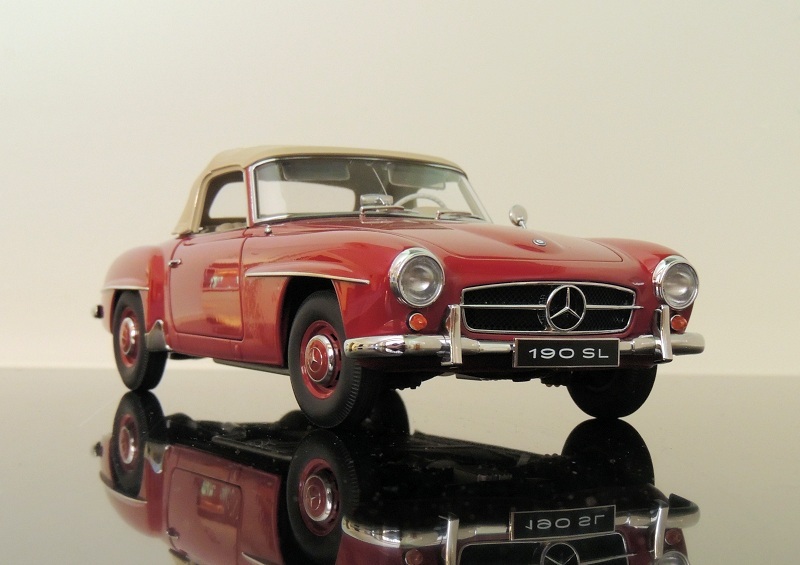 It’s unquestionably the best model Mercedes-Benz 190SL that the market currently offers, and the one which most captures the timeless elegance of the original. It’s worth your money, and your love. 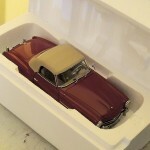 1 Response to "REVIEW: AUTOart 1955 Mercedes-Benz 190SL"
You did not show any photos of trunk/hood.